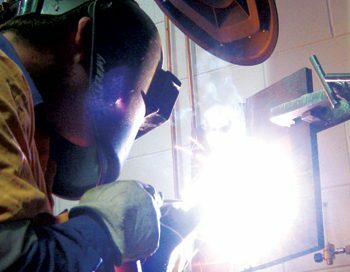 AWS has recently signed an MoU (Memorandum of Understanding) with Weld Australia with a goal to provide quality training and technical services to the Australian welding industry. This strategic partnership comes with the establishment of the Advanced Welder Training Centre, operating through TAFE SA’s Regency Campus. The centre is equipped with welding simulators and other state-of-the-art equipment, and will help ensure SA is prepared to meet the demand created by the Naval Shipbuilding program. It has been predicted that over 1,000 welders will be needed from 2020-2027 during this ambitious, long-term project. The opening of the AWTC was quite an affair, with the Minister for Education and Minister for Industry and Skills in attendance. The event gave AWS and Weld Australia to catch up and discuss the new partnership, which will cover technical services, welder training, qualification and certification under AS/NZS ISO 9606, and welding inspector and supervisor training. AWS has been providing expert welding and inspection training for over a decade, but working together with Weld Australia (formerly WTIA) will help us both to create better solutions for the future of welding in SA.